XENON1T installation in the underground hall of Gran Sasso National Laboratory in Italy. The three-story building on the right houses various auxiliary systems. 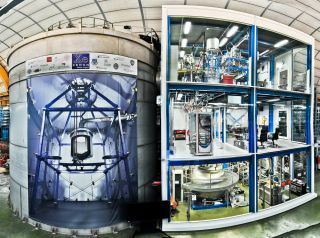 The cryostat containing the LXeTPC is located inside the large water tank on the left, next to the building. XENON1T is looking for the microscopic fireworks created by weakly interacting massive particles (WIMPs) crashing into xenon atoms. WIMPs are hypothetical particles that many scientists think are a primary component of dark matter. Astronomical observations have confirmed that only about 15 percent of the material universe is composed of "ordinary" (or "baryonic") matter; nearly 85 percent is mysterious dark matter, which cannot be observed directly by telescopes. But dark matter's gravity can be measured indirectly via its effects on galaxy clusters and the rotation rates of galaxies, so we know it's out there. Because WIMPs are so "weakly interacting" — that is, they cannot interact with normal matter via the electromagnetic, strong or weak forces — XENON1T can detect them only by looking out for lucky collisions between WIMPs and atoms in a chamber filled with pure liquid xenon cooled to minus 139 degrees Fahrenheit (minus 95 degrees Celsius). When a direct collision occurs, the liquid scintillates (flashes), and there is ionization in the liquid. By studying these flashes, scientists can then determine the exact nature of the colliding particles. But to detect these extremely weak flashes in the Liquid Xenon Time Projection Chamber (LXeTPC), the surrounding natural radiation levels in the cavern must be kept to a minimum. To achieve maximum shielding, the LXeTPC is submerged in a massive water tank that's the size of the neighboring three-story building that contains the auxiliary equipment to support the experiment. The water tank and the natural shielding provided by the tons of overlying rock still aren't enough to ensure minimal radiation interference, however. All materials can produce small quantities of radiation. So, to achieve its record radioactive "silence," the detector's materials had to be selected carefully, and the liquid xenon itself was meticulously processed, the researchers said. These steps were "necessary to listen … for the very weak voice of dark matter," they added in the statement. The first XENON1T results have been made available on the online preprint service arXiv.org. "WIMPs did not show up in this first search with XENON1T, but we also did not expect them so soon!" project spokesperson Elena Aprile, a professor of astrophysics at Columbia University, said in the statement. "The best news is that the experiment continues to accumulate excellent data, which will allow us to test quite soon the WIMP hypothesis in a region of mass and cross-section with normal atoms as never before," Aprile added. "A new phase in the race to detect dark matter with ultra-low background massive detectors on Earth has just began with XENON1T. We are proud to be at the forefront of the race with this amazing detector, the first of its kind." The 135 scientists participating in the XENON Collaboration are from the U.S., Germany, Italy, Switzerland, Portugal, France, the Netherlands, Israel, Sweden and the United Arab Emirates.